Main » 2010 » April » 25 » Tages - 1992 - 1964-68! 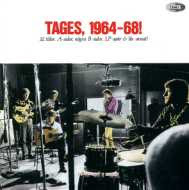 Tages - 1992 - 1964-68! In the early 60s, skiffle was not only a big craze in England, it hit Sweden pretty hard too. In a small town outside of Gothenburg, a 16-year old lad named Tommy Blom had just received a guitar from his parents. One day he met an old school chum, Anders Töpel, who also had a guitar, and who in turn knew a third guitar player, Danne Larsson. These three young boys started playing together, and soon a fourth member was added, Göran Lagerberg. On purpose they chose the "geeky" name Tages (from Danne's middle name) to make fun of all guitar based pop bands with their slick attitude and suits. Soon, however, the four youths decided to change their style, after having been introduced to the new "Mersey" sound. A drummer, Freddie Skantze, was added, and within a short time a reshuffle of the instruments followed. Lagerberg took up the bass, while Danne and Anders were to play rhythm and lead guitar respectively. This left Tommy as lead singer and tambourine player. Their first gig was held on 23 December 1963. Their name was becoming locally known and in August 1964, a Swedish newspaper held a contest called "The Beatles of the West Coast". Many different groups applied, but finally Tages were the victors, earning the right to make a record for the new company Platina. This first recording session took place on 20 September 1964. While the studio was pretty basic, Tages did bring two good songs to the sessions, Sleep little girl and Tell me you’re mine, which were released as a single about a month later. One day, not knowing that the single was going to be tested for the Swedish Top Ten, the boys heard themselves on the radio, and just one week later, the single had reached no. 1, replacing none other than the Beatles. A couple of months later, the next single followed: I should be glad b/w I cry. This was not only a commercial success, but the critics liked it too, and now Tages were accepted by the large crowd. On 31 March 1965, Tages got to open for the Rolling Stones on their performance in Gothenburg. New singles followed, and the first eponymous LP was released in November. At about the same time, Göran and Freddie were allowed to play together with Chuck Berry in Stockholm. The first single after the LP was a change of direction. Their music had previously been rather similar to that of the Beatles and other beat groups, but just like the Beatles, Tages felt the need for change. So for the next single, So many girls, a new instrument was added, the recorder. A more soft sound was the result, and the single was a great success. Therefore, Tages and their management decided that it was time to break the English market. Very thorough preparations followed, new clothes, new equipment, etc. Unfortunately, what the management had forgotten was that work permits would be necessary for Tages to be allowed to play in Britain. The boys had to turn back to Sweden, beginning work on their second LP, simply to be called "2". Another setback was the resignation of original drummer, Freddie Skantze. A replacement was soon found in Tommy Tausis, who had been playing with another important Swedish pop group, the Strangers, until their break-up. Tausis is also present on some tracks on the second LP, which was released in July 1966. Musical experiments became increasingly important to the boys, who were very eclectic in their choice of music, playing many original songs, as well as some carefully chosen covers. The next LP, "Extra Extra", was released towards the end of 1966, and, like its predecessor, consisted of 6 original songs and 6 covers. Covers were taken from many different styles of music: soul, pop, and Motown. On "Extra Extra", there were a number of interesting original songs, showing the band’s willingness to experiment. One song, Extra, featured a theremin, just like Good vibrations by the Beach Boys. Other songs had controversial lyrics, like Secret room. This was also their last release at Platina, since they had signed a contract with the Swedish branch of Parlophone. Tommy Tausis had never really settled in the group and after the release of the third LP, he resigned. The next drummer in Tages was Lasse Svensson, and the first release he was featured on was a revelation: the single Every raindrop means a lot. Finally, psychedelia had reached Sweden. Nonsensical lyrics were combined with a strange musical arrangement, and hey presto, a new change in direction had been made. Together with their producer, Anders Henriksson, Tages now began producing incredibly clever and interesting music, as can be heard on the two 1967 LPs, "Contrast" and "Studio". Contrast only has four covers (plus one especially written for them by producer Henriksson and Thorstein Bergman). Criticism of society, love songs, psychedelia, everything can be found on this LP. The next single, She’s having a baby now, relating the story of an unwanted teen pregnancy, was maybe too critical for the public to accept it, and suddenly, the band lost many of its followers, in spite of the great music they made. A final attempt to break into England was made with the single Treat her like a lady, a cover of a Crewe/Knight song. The promo movie was made by Peter Goldmann, more famous for his work with the Beatles, but the song did not become a hit (allegedly because the wrong people were paid). The England tour was not a total flop, however, since the band was allowed to record a few songs in the legendary studio, Abbey Road. Also, many celebrities, such as Cat Stevens and Roger Daltrey from the Who, really liked Tages music, and the Kinks’ Ray Davies said that Tages’ stage show was wonderful, and that the band really should have a future in Britain. But, unfortunately it was not to be. Having returned to Sweden, Tages recorded their next and last LP, "Studio". Probably the finest LP ever made in Sweden, it is heavily influenced by Swedish folk music. Rock songs featured unusual instrument, such as accordions and flutes, while the softer songs had even stranger instruments. But never did the band lose touch with their rock background, and the LP stands today as testimony to the talent of this Swedish band, who was never to make it big.